Pacific Type 4-6-2 were among the most popular dual purpose locomotives built. They were used for fast passenger service and fast freight service. Many roads used them in passenger service until they dieselized. Owner: Louis (Lou) G. Kohler Jr.
Stroke 2 7/8" x 3 11/16"
Length of Engine:  6' 6"
Cylinder Bore and Stroke:   2 1/2" x 3 1/2"
the engine which were a great help in the construction of mine. 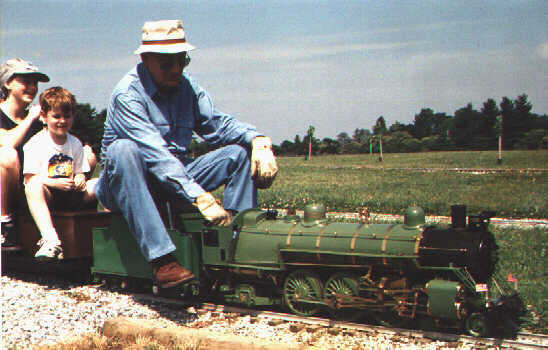 similar full size locomotive can be found in the Smithsonian. Paul Seyfrit bought the engine in late 2011, the boiler is being replaced. Builder:  Weidmyer Brothers: Hancock Md. Length of Engine: Total Length 124"
Cylinder Bore and Stroke:  2 1/2" x 3 1/2"
the aluminum alloy used today. The engine has been sent to Ed's son in Arizona. Track Gauge:  3 1/2"  Scale 3/4"
Cylinder Bore and Stroke:  1 3/16" x 1 13/16"
in England drawing main line specials.